Geoscientists combine the latest analytical advances (transmission electron microscopes, synchrotron radiation methods, DNA, metal stable isotopes) with well-established geo(bio)chemical methods to study the complex interface between rock or mineral surfaces and the environment. Through this approach geochemists can probe this enigmatic interface, revealing the beautiful and complex boundary between the lithosphere and the biosphere, atmosphere, and hydrosphere. 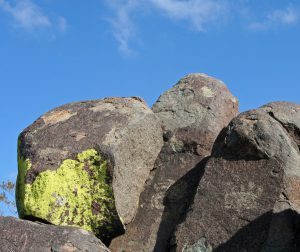 Rock and mineral coatings are more than stains on a rock face. They are archives of history waiting to be uncovered. 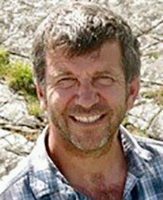 We are excited to announce that Jonathon (Jon) Blundy of the University of Bristol (UK) has accepted the invitation to join the Elements editorial team starting in January 2018 as our next petrology principal editor. He will replace Bernard (Bernie) Wood (University of Oxford, UK) whose term of office ends in December 2017. We will introduce Jon more formally at a later date. Many of you know that Elements is an international magazine distributed to 16,000+ members located in more than 100 countries. But did you know that the Elements Executive Committee and editorial team reflect that international membership with committee members/editors from 10 countries and 3 continents? Our geographical distribution spans 16 time zones resulting in the bulk of our business being conducted by e-mail and conference calls. We also make a concerted effort to hold a face-to-face meeting each year. 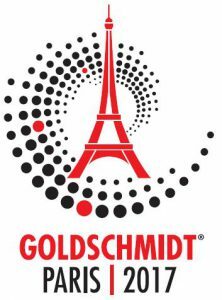 This year the Executive Committee and the editorial team will meet at the 27th Goldschmidt Conference in Paris, France (13–18 August 2017). The Elements Executive Committee consists of representatives from the 17 participating societies ensuring that every society has representation in the operation of Elements and has an active voice in assuring its success. The committee oversees the long term strategy of Elements and its operating budget in addition to proposing and selecting new Principal Editors. If you have matters that you would like your society representative to bring to the table for discussion, please communicate with them soon because the annual face-to-face meeting of the Executive Committee will be held on Sunday, 13 August 2017 at the Goldschmidt conference in Paris. Visit your society website or http://elementsmagazine.org/about/executive-committee/ to connect with your society representative. The Elements editorial team, consisting of three Principal Editors and the Executive Editor, is responsible for overseeing and editing the content of Elements. They will also hold their annual face-to-face meeting on Sunday, 13 August. This yearly meeting is extremely valuable as it gives our editorial team an opportunity to discuss in depth various aspects of publishing Elements. One of our main tasks is discussing the thematic proposals we have received for future issues of the magazine. If you haven’t done so already, submit a thematic proposal for our consideration. More information about submitting a proposal can be found at http://elementsmagazine.org/publish-in-elements/. Elements will also have a booth at the conference. Please drop by! This is an occasion for you to meet the Principal Editors, Executive Editor, and the Executive Committee. Invite your colleagues and/or students who do not currently receive Elements to visit the booth. We will have information available about our member societies and have back issues available for purchase. If you have an idea for a topic that could be included in the Elements lineup, please contact our editorial staff by 15 July 2017. The Elements editorial team will evaluate proposals for the 2019 lineup in early August prior to the Goldschmidt meeting in Paris (France). Visit the “Publish in Elements” webpage for more information (http://elementsmagazine.org/publish-in-elements/).